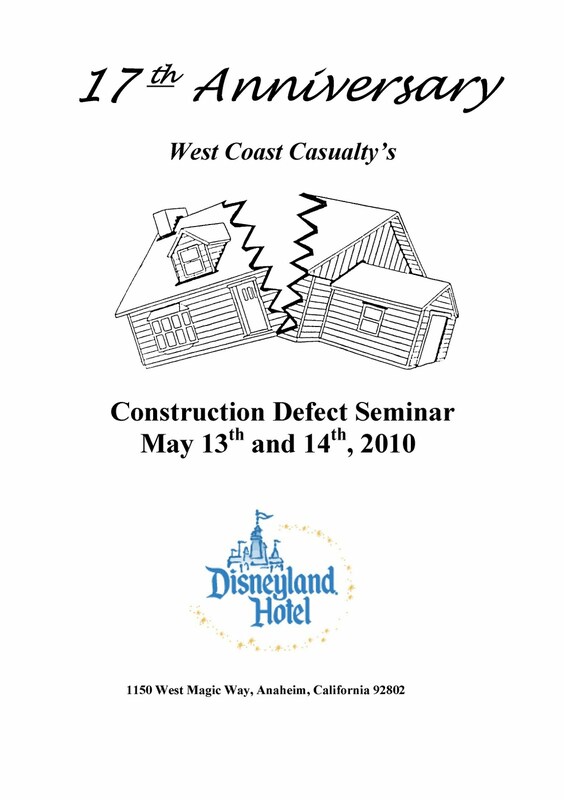 Sheri Roswell and I will be speaking at the 17th Anniversary West Coast Casualty's Construction Defect Seminar, to be held on May 13th and 14th at the Disneyland Hotel in Anaheim, California. 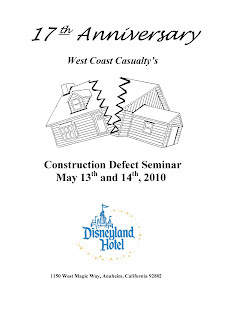 For those of you who have not had the opportunity to attend one of the first 16 seminars, the WCC seminar is "the largest seminar of its kind worldwide focusing on all of the elements of the prosecution, defense, coverage and technologies of construction defect claims and litigation from a national perspective." Our panel, entitled "Standing . . . Who Really Has the Right to Bring an Action in Construction Defect Cases? ", will be moderated by the Honorable Mark Gibbons, of the Supreme Court of Nevada. Other panelists will include the Honorable Allan Earl, of the Nevada District Court, the Honorable Rex Hesseman, of the Los Angeles County Superior Court, the Honorable Pendleton Gaines, of the Superior Court of Arizona for Maricopa County, Mark Scheer, Esq. and Dirk Holt, Esq. of Scheer & Zehnder, LLP. Please let me or Sheri know if you will be attending the seminar, as we would like to see you in California. If you will not be attending, and have questions regarding construction litigation in Colorado, please view our website or contact me for a copy of our Overview of Construction Defect Litigation in Colorado. I can be reached by telephone at (303) 987-9813, or by e-mail at mclain@hhmrlaw.com.